Tom Marshall remembers a time when he would stand at the front of a classroom in his Sarnia Fire Rescue uniform and ask how many students had working smoke alarms at home. A scattering of hands would rise. “Now nearly every hand goes up,” says the fire department’s public education officer. Marshall, 59, says it’s been an “honour and a privilege” to directly speak to as many as 6,000 local residents a year about fire prevention and safety. But all good things come to an end, and he is retiring after more than 27 years of service. The man, who has been a familiar face to countless school-aged children, will be replaced by an as-yet-unnamed education officer. Marshall was raised at Ipperwash and began volunteering with the Forest fire department in 1978. 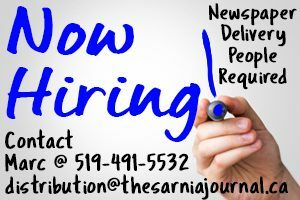 Nearly 10 years later, he was hired as a full time professional firefighter by Sarnia Township, and then joined the city’s fire department with amalgamation in 1991. Interestingly, grandfather and grandson were both identified as firefighter Number 67 at their respective departments. Marshall said that during his years of fighting fires he attended many calls involving unattended cooking. Many kitchen fires were caused when people became impaired and used poor judgment. Drinking and cooking is as lethal a combination as drinking and driving, said Marshall. In 2002, he moved to the fire prevention office, doing inspections and some community education. Five years later, he took on the full time role as the department’s public education officer. 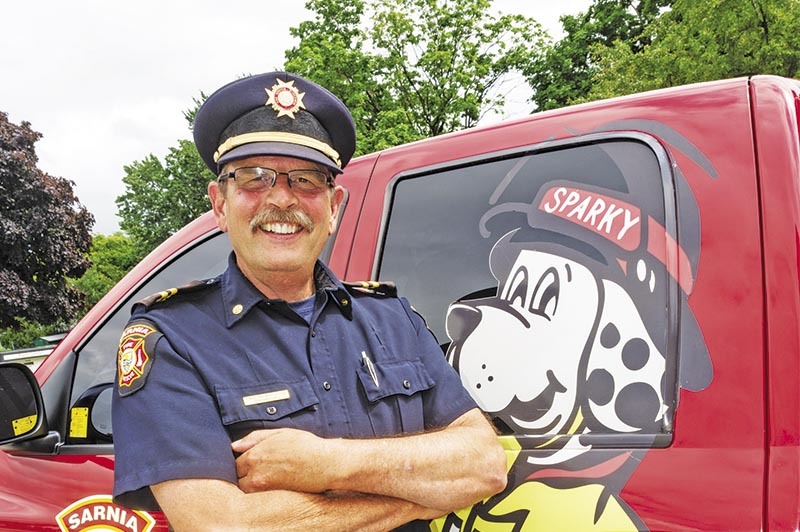 He made it his own, raising public awareness by working with media, rewarding local citizens for fire prevention work, and canvassing for a fire education truck he affectionately calls Sparky. Marshall introduced annual safety awards for the best fire drill times in local schools. He initiated the Chief of the Day program to recognize local kids for their fire prevention knowledge. Annually, he’s visited at least 25 elementary schools, senior fairs and high-rise buildings. In recent years, Marshall started to teach kitchen safety to high school home studies students. Marshall’s final day on the job is July 31.